On November 10, 2011 Sprint announced the Samsung Epic 4g would be updated to Gingerbread S:D700.0.5S.EI22 over the course of the next ten days. Sprint’s intent of slowing updating everyone to the EI22 ROM is to be able to monitor the process in the event they have to pull the update due to technical problems. Already users are reporting WiFi, GPS, and keyboard bugs which Sprint or Samsung has yet to acknowledge. For those of us who are too anxious to wait on the OTA now have several methods available (a few of these methods have fixes already available). IMPORTANT: Please make sure that you make backups of all your information before doing any upgrades, while some methods like the update.zip is rather safe, it doesn’t hurt to make a copy of what is important to you. For those who have clockworkmod 2.X (green one), you should upgrade to the latest clockworkmod 3.X (purple) as old clockworkmod backups will not be compatible. 1) First method is to do a manual update. a) Go to this link and download the file gTen has provided. 3 This is NOT a custom ROM it is the manual way to upgrade. b) first you need to install the OTA either through the OTA method or through the Google link method. 1 confirm you have gingerbread EI22. 3 Put the su-3.0-efgh-signed.zip file onto your sdcard and turn off the phone. 5 open odin and connect the phone to the computer, one of the ID:com boxes will light up to confirm it is connected. 6 put the ACSrecovery.tar.md5 file into the PDA area of odin, make sure everything is uncheck except Auto-reboot and hit start. 7 if done correctly your phone should reboot directly into ACS recovery mode. 8 once in recovery flash the Su-***** .zip file then reboot the phone. 9 If CWM does not stick due to the added script Samsung embedded in the phone kernel you should see below. There are thus far, 2 possible options, Option 1 will give you the Keyboard fix with a relatively Stock experience and Option 2 will give you a Deodexed Rom, nubernal, the keyboard fix and the GPS fix. Apparently Samsung included a script that reflashes the stock recovery upon boot, so if you install a custom recovery (ACS or CWM) it will overwrite it upon boot. i) First Odin Mkasik’s EI22 Keyboard fix Kernel (PDA – Only check Auto Reboot) Then Odin Purple Clockwork. 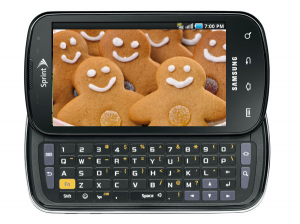 e) (Option 2) override the built in Samsung issue and make CWM as well as add the nubernal. i) Follow the steps up until you get into ACS recovery or CWM and flash the .zip in this post rather than the Su.zip file. ii) This will completely fix your GPS and CWM problems as well as deodex the EI22 version you have.